In this part of the Java Video Tutorial I cover most every method available for manipulating Strings and StringBuilders. 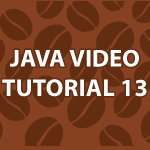 This is one of the last simple Java Tutorial videos. Everything after this will cover advanced topics. All of the code follows the video. It is very heavily commented. If you print it out it will help you better retain this information. // a String a new version is created in memory. Thanks for the video ,u r doing a great job Derek. Derek thanks for video, u said in one of the reply to my comment that Java combined with c can do anything,is it really possible, i mean Can Java & C be combined to form Softwares, if so how?,Plz do respond. 1. Can you post a video on how to parse a text file using Java. Thank you very much 🙂 I’m happy that you are enjoying them. Derek, aah!! what to say about you. keep it up!! you are just fabulous, MashaALLAH.